Today we use the term “cloud” without thinking about it. We use it mainly in terms of storage online, far away and unreachable. We can’t plug in a USB memory in the cloud to download data. We plug the USB into our own computer, connect to the cloud and download, as if it was a local storage. In the two great Wikipedia articles Cloud storage and File hosting service there are a lot of information on architecture, potential threats and costs, but nothing really on the origin of the word cloud. Searching online you get a lot of answers of the meaning of cloud, some better than others. One of the more fun comes from Rebecca J. Rosen’s article Clouds: The Most Useful Metaphor of All Time?
. . . when engineers would map out all the various components of their networks, but then loosely sketch the unknown networks (like the Internet) theirs was hooked into. What does a rough blob of undefined nodes look like? A cloud. And, helpfully, clouds are something that take little skill to draw. It's a squiggly line formed into a rough ellipse. Over time, clouds were adopted as the stand-in image for the part of a computer or telephone network outside one's own. However amusing, it still doesn’t answer the question – where did it come from? Who coined it? What’s the origin of the metaphor cloud? OK - I'll start the ball rolling. The origin of the term cloud computing was derived from the practice of using drawings of stylized clouds to denote networks in diagrams of computing and communications systems. The word cloud was used as a metaphor for the Internet, based on the standardized use of a cloud-like shape to denote a network on telephony schematics and later to depict the Internet in computer network diagrams. The cloud symbol was used to represent the Internet as early as 1994. 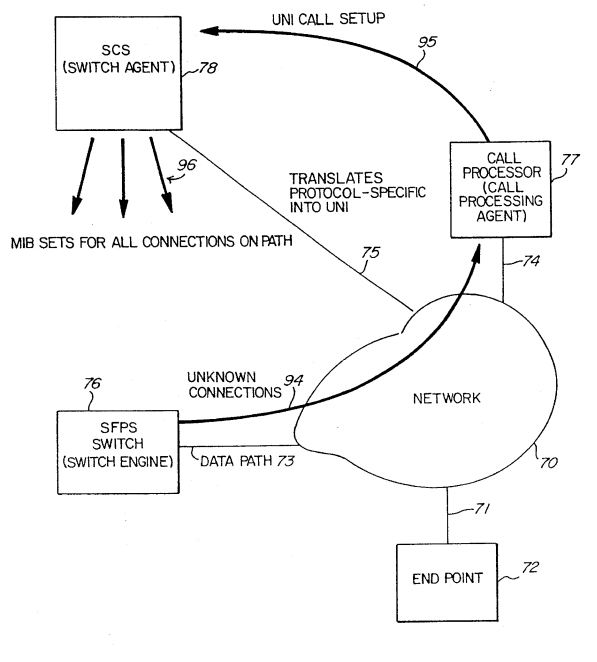 [Links to to US Patents] Servers were then shown connected to, but external to, the Cloud symbol. The idea of an "intergalactic computer network" was introduced in thesixties by J.C.R. Licklider, who was responsible for enabling the development of ARPANET (Advanced Research Projects Agency Network) in 1969. The expression cloud is commonly used in science to describe a large agglomeration of objects that visually appear from a distance as a cloud and describes any set of things whose details are not inspected further in a given context. Example: in mathematics, a point cloud is a large number of points in a coordinate system. I suspect that IT just took over the same term. According to this article, the term was introduced in IT in 1996, at Compaq Computers. Sorry guys coming to this late. YEARS late, but enjoyed the banter. I liked Roger Attrill's explanation. I think I agree that from an ICT perspective it was the telcos who first used the term "cloud". I was in telecoms since 86 and it is very true, we were using and describing cloud for all sorts of products in early 90s, Voice VPNs (remember those? ), and later Frame and ATM being two classic products and now it would be MPLS. The internet is just another product in the WAN arsenal, and likewise would also be described/shown as a cloud. Couldn't get pictures of clouds then, so we had to make them up for presentations using shapes. Mainly we wanted to raise the bar and become more embedded into the clients operation and what better way than make the products more of a managed service offering (sound familiar)… thus what happens in the middle becomes irrelevant – a cloud. “No need to worry about what happens in here, Mr Customer, we’ll take care of this…”. Just like SaaS, etc. The goal is “sticky products” to lock customers in to “value” to keep the ever increasing competition out. So, if it got to me in the early 90s then it must have been around long before that else where. No not “Cloud Computing” as such, but maybe the seed, being much the same and based on and dependent upon the telco space. PS: I am UK based and used to deliver services globally for Cable & Wireless to the world’s largest enterprises, mostly UK and US HQ’d. In 1990 I started going to data networking gatherings where clouds were prevalent. My guess is that they predated the 1980s. Back then a cloud represented a "network" of undefined proportions and end-points that was constantly changing. Seems like an apt description of natural clouds when one lies on the ground and studies them for a while. Not the answer you're looking for? Browse other questions tagged terminology metaphor original cloud or ask your own question. Is there a widely-understood visual metaphor for privacy? What is a good UI metaphor for switching roles user plays in the application? Folder naming standard for storing app backup data on user's personal cloud? Migrating files structure to the cloud, should all files be copied?